Patients and staff at Ellern Mede can echo the BBC’s November story about Selkie the Labrador’s amazing contribution to childrens’ happiness. 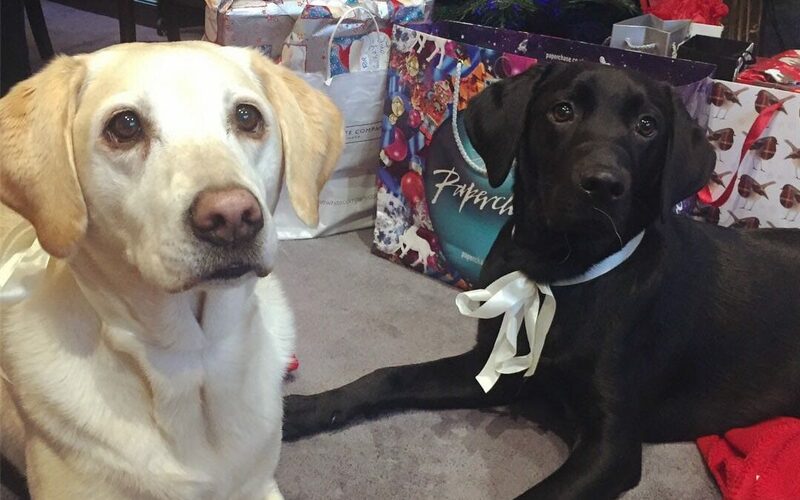 We have Silke the Labrador (above) and her companion, Indie, who like Selkie, are not trained therapy dogs but have had a great impact on patients at our children’s hospital. They visit regularly – both at the bedside or for those who can play outdoors. Pictured here in appropriately festive attire for Christmas, they will be around Ellern Mede making Christmas here feel more homely for those who are with us at this special time of year. At Ellern Mede, some of our patients have Pervasive Withdrawal Arousal Syndrome which means they don’t move their limbs or speak. We have seen breakthroughs with these patients who gradually find their will to stroke Silke or Indie overcomes at least part of their illness and they reach out to touch them. Wheelchair-user, C, found throwing a ball for the dogs in Ellern Mede Ridgeway’s large grounds one of her favourite pastimes while in hospital. The BBC’s video of how Selkie the Labrador plays a special role in a primary school in Bromley, London, where she has helped children with bereavement and anxiety issues, encouraged us to share how Silke and Indie play that role here in a hospital setting for children. Pupils and teachers say Selkie has become a valuable part of the school.